Eight years ago, Fr. John O'Connor and Affiliated member of the De La Salle Brothers, began the Food For Faith website as a way of offering available encouragement for people seeking to mature in their relationship with Jesus Christ. Over the years the project has grown and now many people in New Zealand and further afield, follow the regular posts at www.foodforfaith.org.nz. Earlier in the year, the program offered a LENT ONLINE RETREAT giving people the opportunity to sign up to receive daily email encouragements still available online. Many of those who found the reflections helpful were teachers in our schools who used the materials not only for their own Formation, but also as a classroom resource. After the online LENT journey, many people requested this style of daily online reflection to be offered more regularly. In response to their enthusiasm, they are offering an ADVENT online retreat. Every day of December 2017 those who sign up will receive an email of encouragement consisting of a paragraph or two, or a brief video clip or podcast. 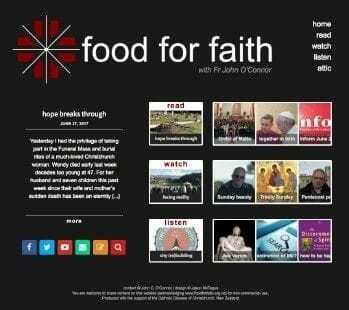 Fr John invites you to spread the word by sharing this invitation with anyone you think might be interested "Food For Faith NZ."